Version 7.3 - New Features, New Insights, New Style! Sage CRM recently released Version 7.3 as an update to their insightful and compelling CRM solution for small and medium sized organizations looking to accelerate sales performance and drive sales productivity. With a suite of new Business Accelerators for Sales, added business insights, a contemporary user experience and an enhanced mobile and email marketing solution, Sage CRM version 7.3 addresses the key business challenges faced by busy sales organizations every day. Added business insight to optimize the sales team and drive sales productivity. A new suite of Business Accelerators for Sales to access a range of preconfigured alerts and notifications. New sales dashboards that display a range of reports & charts for better insight and trend analysis. New KPI charts for greater sales performance analysis. The ability to email PDF Quotes and Orders with just one click for rapid sales follow up. Along with the above features, Sage CRM version 7.3 comes with a fresh, new contemporary look and feel with a new navigation that delivers an enhanced user experience. The new UI theme is simple and easy to use, making navigating Sage CRM more intuitive than ever before. 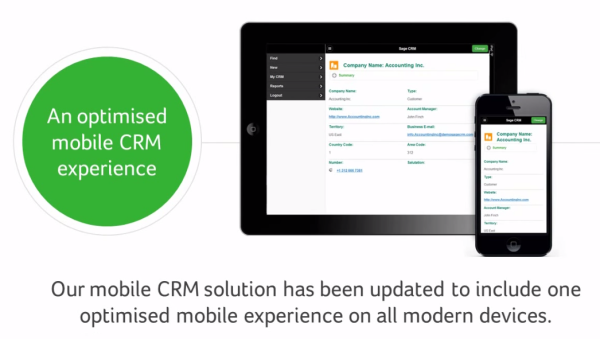 Sage CRM 7.3 offers an optimized mobile experience that has been updated to include all modern devices enabling users to stay in touch with key CRM information anywhere, any time. An updated Sage CRM app for both iPhone and Android allows users to accomplish more with a range of added features and a brand new look and feel so sales teams can keep on top of sales activities when on the road. Sage CRM 7.3 offers customers more choice to meet their email marketing needs. Using the new Sage CRM MailChimp integration allows businesses to easily create, send and track targeted email marketing campaigns. and even more thrilled with the new features! Download the Sage CRM v 7.3 PDF Spec Sheet to learn more! We would love to speak with you about how the Sage Customer Relationship Management soltuion, partnered with Klear Systems, Inc., can benefit your organization.